This is the list of electric vehicle parts, with explanations, that Paul used in his $2000 VW Bug conversion. This is a DC conversion, so an AC conversion will have a slightly different parts list, but it's basically the same. This is part 2 of a three part interview; the first part is about how he built an electric car for around $2000, and the third is about his do-it-yourself DC motor controller. Lynne: Paul, as you walk me through the process of converting your car, can tell me about the electric vehicle parts you used? Connecting the motor to the transmission was the hardest part for me. I had almost no tools except for a hammer and a screwdriver. 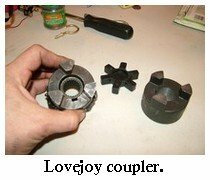 I bought a pair of L-95 Lovejoy couplers, as well as a black hard rubber spider thing that goes between them. The lovejoy is used on farms for adapting one type of machine post to another. I had to weld a spline from the transmission onto the end of one of the lovejoys so the transmission shaft would slide right into one of the couplers. I had never done welding before, and had no equipment, so I bought a used arc welder and learned how to do it by watching welding videos in a welding class during the prep period when I would substitute there. 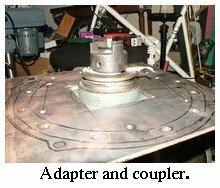 I also built an adapter plate by using twelve pieces of 1 inch diameter solid aluminum rod as spacers. They were about 60mm each +/- 0.1mm or so. I bought a $15 harbor freight digital calipers that was really helpful with the measurements, as well as getting things centered, and two 1/4" thick steel plates. The plates were about 12"x13" and 14"x14" I think. I was substituting in a welding class, and I asked the regular teacher (who had stopped in) if I could buy them from him, since I didn't know where to get steel plate. He sold it for the bulk price that he pays. All the stuff for adapter plate and coupler was around $80. The motor was $126 (I think) from Ebay. It's a 62 pound, 24v 103amp (1 hour rating) brushed DC electric forklift motor. It was sort of in rough shape, so I had to learn to take it apart, which wasn't that hard. There was weird stuff on the copper bars that the brushes rub against (I think that's the rotor), so I scraped it all off with a little screwdriver, and then smoothed it out with some brillo pads. It then ran pretty smoothly. I mounted it to the transmission with the new adapter plate and couplers. It seemed to work great when I would connect the motor straight to a 12v battery. I had almost bought a 48v 400amp controller on Ebay, but I was outbid at the last second by the Forkenswift guy (Darin). I then found a 48v 300amp controller for $85 on Ebay. The EVDL people suggested that 48v and 300amp wasn't going to give very good performance. I was really sad for awhile, but then there was a guy that was selling 72v controllers on Ebay for $300 each. 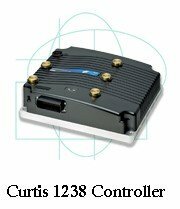 I was able to somehow sell the 48v controller for like $150 on Ebay! So, I bought the 72v controller. It worked great for around town. I could keep up with traffic, and go about 35-40 mph pretty easily. Then I made my own, and after the first successful test, I sold the 72v controller on Ebay for like $380 or so. Ya! More on the homemade DC motor controller later. Chargers, plural, actually! I bought 7 12v 6amp harbor freight battery chargers. They are $19.95 each when on sale, which is about every month. I have each of the 6 batteries that are in series hooked up to it's own charger. Then I have one charger hooked up to the auxiliary battery that powers the lights and blinkers and everything. I have a power strip that I just plug in all the chargers into. Then I have that power strip plugged into a retractable extension cord that I can plug in anywhere that has a regular 110v outlet. That single plug turns on all 7 chargers. When each respective battery is done charging, it's charger shuts off. The 12v electrical system battery is just an old deep cycle battery I had from Costco. The one really big purchase for the car was the six 12v AGM Sears Platinum Edition deep cycle batteries. They were $239 each (yikes). We had no money, and I had been going around to the dumps to try to find old 12v deep cycle batteries. My wife went to Sears, applied for a Sears card, and we got those! Usually people recommend 6v batteries for EVs, but these have a 3 year warranty on them, so I figured that even if they only lasted for a year, I could always get six more for free. They have worked great from last August until now. I am careful not to discharge them too far, and I recharge them right after driving at a nice and gentle 6amp rate each. It helps them to stay balanced by using individual chargers for each battery. I'm using 2 gauge cable. I've heard of people always using 00 gauge, which was more expensive, but I read about a guy that was using 2 gauge without any problems, so I thought I would give it a try. I bought a bunch of pieces of 2 gauge flexible cable on Ebay for around $50 I think. I didn't really need any long pieces, since I decided to put the 6 batteries where the back seat used to be, and the motor was also in the back! (1971 Volkswagen Superbeetle). I bought some heavy duty 2 gauge cable lugs online at somewhere. I bought a big set of bolt cutters from Harbor Freight, and grinded out a little hex shape inside where you clamp it down. It works really well for crimping 2 gauge lugs, and was way cheaper (about $20) than the usual $300 crimping tools. I made my own pot box (for the throttle), but it was really crappy, so I just bought a PB-6 pot at some random online store. I felt particularly proud of the current meter. I thought of something really sneaky! It turns out that others had already done this too, but I still felt proud. The total cost was about $1.99 for the meter and the shunt. It measures battery amps. What I did was take a harbor freight $1.99 volt meter (or was it $2.99? Don't remember. ), put it on the 0-200mV setting, and choose a length of the 2 gauge cable such that its resistance would cause a voltage drop of 100mV at 400 amps. It turns out that 2 gauge cable has 0.1562 Ohms per 1000 feet, So, I needed a chunk of cable that was 1.6 feet long. Hey! I needed one of the cables to be that long anyway! So, there you go, a free shunt. Copper changes resistance as temperature changes, but it is within about 5% accurate, which is plenty. Instead of showing current, it shows a scale of 0 to 100, where 100 means 400amps (the most the Curtis controller could put out), and 0 means 0amps. 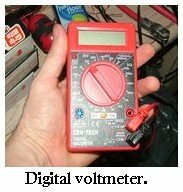 For the volt meter, I just bought another $1.99 volt meter from harbor freight and set it on the 0-200V setting. It's my loose "gas gauge" and lets me know how far the pack is sagging when I accelerate. I have been using four 10 watt resistors in parallel from Radio Shack. I bought some angle iron, and welded it into a rectangle shape with my new welder. I used that as the base in the car, and then made a wooden box that went inside the angle iron rectangle. I stuck all the batteries inside the box in the back seat. Lynne: I see you found a lot of your electric vehicle parts on Ebay, a few things at Radio Shack, Harbor Freight, and maybe the local hardware store for some of the tools. I think a lot of people think they have to go to a special "electric vehicle parts" store for their conversion stuff, and they really don't. Go from Electric Vehicle Parts List back to Build Your Own.